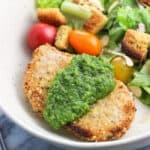 Parmesan almond crusted pork chops are baked and topped with parsley pesto for a relatively quick and easy main dish recipe. Preheat oven to 375°F. Place an oven-safe wire rack over top of a baking sheet and spray with cooking spray. Set aside. Whisk together egg and milk in a bowl. Add 1/3 cup sliced almonds to the bowl of a food processor and pulse a few times until almonds are broken up into small pieces. Add breadcrumbs, Parmesan, processed almonds, and salt and pepper to taste to a shallow bowl and stir until evenly combined. Dip all sides of each pork chop first in the egg mixture, and then in the breadcrumb/Parmesan/almond mixture, pressing the coating onto the pork chop to help it adhere. Place pork chop on the prepared rack over the baking sheet. Repeat for all pork chops. Bake for 23-26 minutes, or until the center of the thickest pork chop reaches 145°F. I stuck them under the broiler for a minute or two once they were fully cooked to crisp the coating up a bit more. While the pork chops are cooking, add parsley, garlic, almonds, and salt and pepper to the bowl of a food processor. Process until parsley is broken up into small pieces, occasionally scraping down the sides. Add olive oil and Parmesan and process until well-mixed. Serve a dollop of parsley pesto on top of each pork chop.